Friday night's blue moon, as captured by astronaut Scott Kelly from the ISS. You can learn more about blue moons here, thanks to NASA. This week on the ISS, the six members of Expedition 44/45 were busy as usual, with the three recently-arrived spacemen Kjell Lindgren, Kimiya Yui, and Oleg Kononenko integrating well into their new micro-gravitational positions. They worked on various biomedical experiments, did spacesuit maintenance, and transferred cargo from the recently-arrived Soyuz spacecraft. 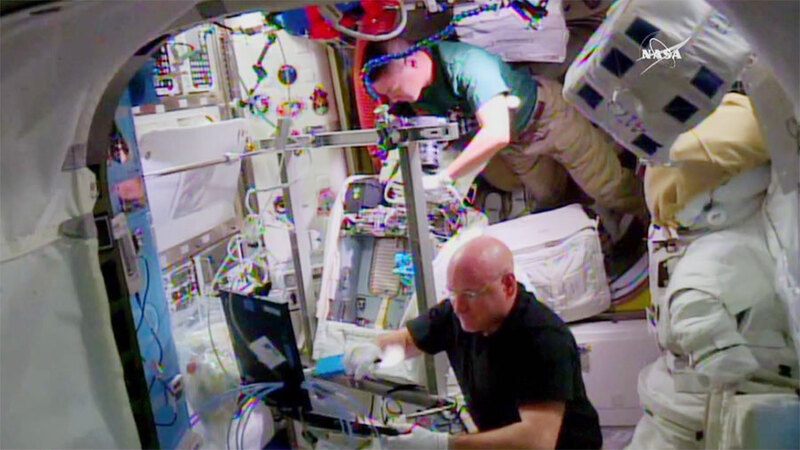 Astronauts Kjell Lindgren (top) and Scott Kelly conduct spacesuit maintenance. Space fashion is so high-maintenance! Kononenko is helping the current ISS commander, Gennady Padalka, prepare for the spacewalk that the two intend to take on August 10th. The six-hour extravehicular activity will have the two exit via the Pirs module of the station, with the intent of taking a detailed photographic study of the exterior of the Russian segments. They will also retrieve a science experiment positioned on the station's exterior, take samples of any buildups found outside, and even do some detailing - a window-washing to remove accrued space debris. Want to a take a spin around the ISS for yourself? Now, it's easy, thanks to the documentation photos captured by departing astronaut Samantha Cristoforetti. Before leaving the ISS last month, she shot 15 images inside each of the modules, and the stitched-together photo composites can now be accessed as a panoramic photo tour. Options for explanations of different elements by Cristoforetti, or pertinent articles on items are also included. The current tour includes the U.S. and Japanese modules, with the Russian segment imagery to follow later this year. Later this month, a resupply mission from Japan is bound for the station no earlier than August 16th. JAXA (the Japanese Aerospace Exploration Agency) will be sending the H-II Transfer Vehicle-5 (HTV-5) up with new science gear and other supplies for the station. Chillin' over China - clouds and mountains form a multi-textured landscape from space. Astronaut Scott Kelly held a Q&A over Twitter this week, answering many questions about ISS life. And finally, while scratching off yet another week in his One-Year Mission, Kelly captured some more amazing images from his orbital post. You can read all about Kelly's fascinating mission - mirrored on Earth by his twin brother Scott - on NASA's "Twins Study" page. That's all for this week, space fans! See you next Sunday...watch this space! The Andes, looking grand in a moment of diffracted sunlight. Spending a year in a tightly-packed closed environment can't ever get boring due to this view!